Yup - when you win by 30 you tend to dominate all aspects of the game. Just as the St. John's Free Throw Rate of 93% was garbage, I have to say that the FTR for Rutgers is also garbage. At least the referees were somewhat consistent in this one, because it's not like Marquette shot a whole lot of free throws either. Marquette's defense was in full effect, pushing Rutgers to 31.3% turnover rate... or a turnover one out of every three trips down the court. The team continues to trend in the right direction. Now, certainly the stellar offensive and defensive performances against Rutgers helped boost these trend lines, but remember that the lines above also reflect a moving 5-game average. Clearly, the next three games will be a better reflection of how the team is trending, but for now we are hitting on all cylinders. Current Adjusted Offensive and Defensive Ratings are 113.8 and 88.6, respectively. Those numbers suggest a team that goes 17-1 in conference... which is a nice way of looking at how well the team is playing over the last five games. As we had previously discussed, one of the big concerns for Marquette was their inconsistency. Well, MU continues to play at a high level and do it at a consistent rate. It is not as if MU is winning with high risk strategies, which should be very good news for MU fans. Unfortunately, there is one negative trend appearing for Marquette. 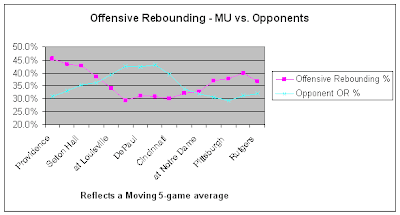 There was a long stretch where Marquette's Offensive Rebounding Percentage (OR%) was improving and our opponents' OR% was declining. For right now, those trends are both heading in the wrong direction. We'll continue to monitor and see how things end up. It's hard to grab a lot of offensive rebounds when you shoot 56% from the floor. Check back tomorrow morning for the Cracked Sidewalks preview of the Villanova game. Our trend in consistency dates back to Barro starting. We are running more varied sets on O, and our on ball pressure is better as they have Ouse in the rear. Also, we have not had an early deficit to overcome with him in at the tip like we did earlier in the BE. Once this team gets off track in their offense they do not get back on easily. I like working in Mbackwe because it comes at the expense of Burke. Burke is nothing more than a space filler while Trevor tends to make a difference on the boards and is at least an option on offense. I am a little concerned about his post defense, but he is no worse than Burke. Regardless, I don't see this hurting Barro whatsoever. Remember Trevor is truly a freshman and his learning time is very limited. "I want to play this year", seems very unrealistic when you consider the difference in experience. I'm not sure which is poorer judgement this or Crean saying what a great guy Sampson is.